Brooke Armstrong is a Ceramic Sculpture Artist. Originally graduating with a BA from SUNY Potsdam, in Northern New York. She has traveled to Boulder, Colorado to obtain a Post-Bac certificate in Ceramic Art, as well as New Bedford, Massachusetts for graduate Studies in their MFA program. Then, she moved to Northern California as an Artist in Residence at the Mendocino Art Center. Most recently she has been living in Comptche, California as an Artist in Residence at Flynn Creek Pottery. Intimacy is a ceramic bowl belonging to a wooden table. It is holding a cup in your hands. Putting your lips to its lip. It is a sweater that is worn. How its fabric feels on your body. It is a way of holding. It is breaking down space, while also creating a space. It is searching to understand boundaries and proximities. Intimacy is feeling at ease. It is soothing and rhythmic on one side, while sharing a wall with sacrifice, heaviness and burden on the other. Intimacy is touching, holding, stringing, swooping, carrying, and attaching.Clay’s ability to form intimate relationships is two fold: First, for the artist, there is the physical touch and time going into the work that creates a bond. Secondly, there is the work. Ceramic work traditionally being an object, is created to be held. This work is searching to understand the intimate experience for the viewer, as each viewer has their own intimate relationship to a work of art. This is a synergistic relationship created by the vulnerability of the artist, and the viewer’s reaction to it. 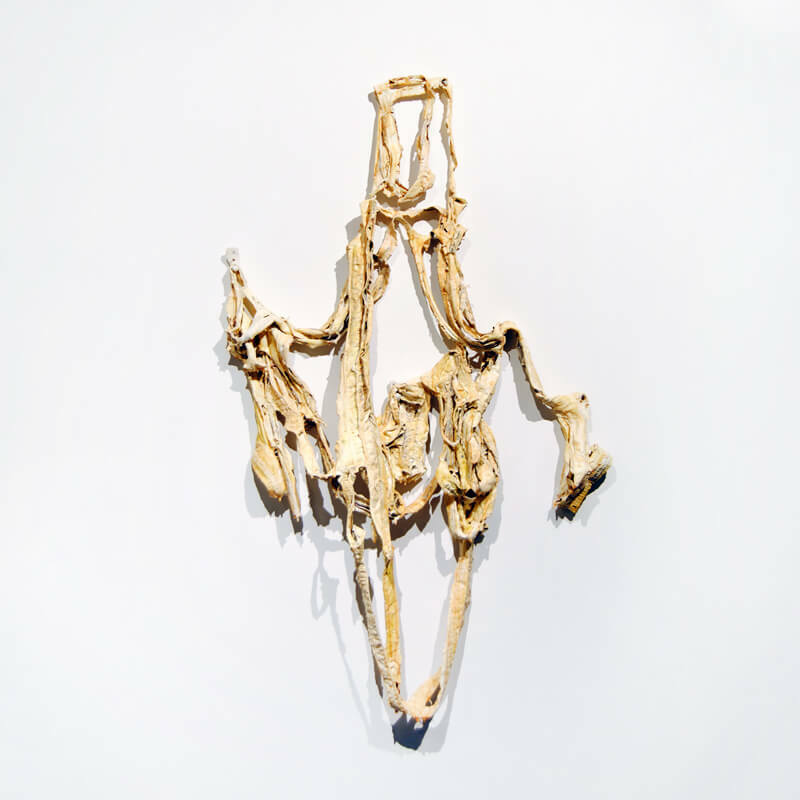 The work plays conceptually with clay’s traditional role of ceramic objects living in hands, routinely as well as ritualistically, being used. The work aims to explore the spaces and conditions, both physical and psychological, in which intimacy is created.